Lisbon: Círculo de Leitores, 1993. This is the first Portuguese hardback edition of The Dark Wind. This edition was published in Lisbon, Portugal by Círculo de Leitores in 1993. The text was translated from Tony Hillerman's original text in English to Portuguese by Gabriela Corte-Real and the title translates to "The Black Wind". 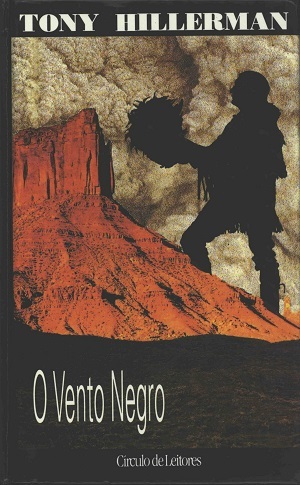 The cover design was done by A. Rochinha Diogo and depicts the enlarged shadow of a man wearing a Kachina costume climbing a mesa side. Format: Hardback, 20.3 x 12.8 cm. Binding: Board cover with full-color illustration on cover, and the author and title printed vertically in white on the spine.